The Chevrolet Camaro is an automobile manufactured by General Motors and Chevrolet under the Chevrolet brand, classified as a pony car and some versions also as a muscle car. It went on sale on September 29, 1966, for the 1967 model year and was designed as a competing model to the Ford Mustang. The car shared its platform and major components with the Pontiac Firebird, also introduced for 1967. Four distinct generations of the Camaro were developed before production ended in 2002. The nameplate was revived again on a concept car that evolved into the fifth-generation Camaro; production started in 2009. A new Camaro convertible joins the 2011 Chevrolet Camaro lineup. 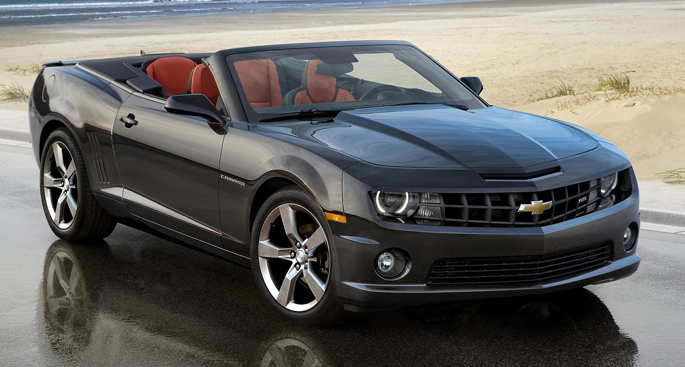 The Camaro convertible is equipped like the coupes, and it's available with either the smooth 3.6-liter V6 or in 6.2-liter V8 SS trim. The reborn Camaro begins its second year with the 2011 model, and it's turning more heads than ever because the striking styling is starting to sink in as more new Camaros hit the road. 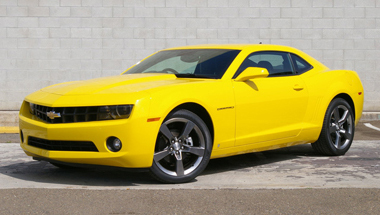 Ten exterior colors are available, including a Corvette yellow that guarantees the car will gather many thumbs-up. For 2011, a color called Synergy Green Metallic is added. Camaro LS and LT models use the Cadillac 3.6-liter V6 with a 6-speed manual transmission standard and 6-speed automatic (with semi-manual shifting) optional. The V6 revs to 7000 rpm and sounds sweet along the way. The horsepower rating for 2011 Camaro LS and 2011 Camaro LT models has been upgraded to 312 horsepower. It was 304 hp on 2010 models, but it's the rating that changed, not the output. Additional testing found the Camaro's intake system to be more efficient than the Cadillac's, on which apparently the previous power estimate was based. The Camaro SS uses four-piston Brembo brakes, but because it's 200 pounds heavier, the stopping distance isn't much shorter. However, the Brembos with four-piston calipers make the brakes on the SS more resistant to fade, important on race tracks and mountain roads where the brakes are being used repeatedly. The TAPshift manual automatic transmission does what you tell it to do. But the 6-speed manual transmission with the V6 is the most all-around usable sporty combination (the V6 because 426 horsepower is overkill on the street). The gearbox is solid but not slick, and the throws are shorter than some. The 6-speed shifts nicely, including easily down into first gear for hairpin turns. The Chevy Camaro Accessories include a recessed speedometer and tachometer stylized in square chrome housings, a nod to the classic Camaro interior. But that was 1967. Back then they didn't have LED light pipe technology, an ambient light option that gives the cabin a warm glow. There's a driver information center between the speedo and tach, its functions controlled via a stalk on the steering column. The low bolsters make getting in and out of the Camaro easier. The front seat slides 8.5 inches and the steering wheel tilts and telescopes, so drivers of all sizes will fit. Based on the 2006 Camaro Concept and 2007 Convertible Concept, production of the fifth-generation was approved on 10 August 2006. 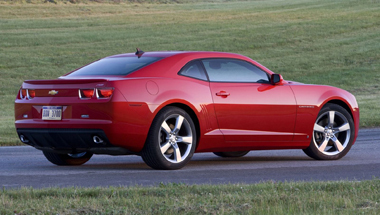 The new Camaro went on sale in spring of 2009 as a 2010 model year vehicle. The appearance package is available on both the LT and SS and features 20-inch wheels with a darker gray tone, halo rings in xenon lights, and red RS or SS badges. LS and LT models are powered by a 3.6L V6 producing 312hp mated to either a 6-speed manual or a 6-speed automatic with manual shift. The SS is powered by the 6.2 L LS3 V8 producing 426 hp and is paired with a 6-speed manual.